When I started Contagiously Positive the plan was for it to be a life coaching practice. At the beginning, I was terrified. I was leaving behind a ten-year career that I had not only gotten pretty good at, but also very comfortable with. And, I had no idea what it meant to be a life coach, or entrepreneur. But I wasn’t happy and I had a calling, a deep desire to serve, so I said F-You to the fear (still full of fear) and I decided to give it shot. The truth is, many of us, myself included, become blocked because we think we are choosing the safer route. We may not be happy, but we know that we are unhappy so we think that it is better to stay with the devil that we know – so to speak. Starting over, or doing something new, brings up limiting beliefs, especially where fear is involved. Sometimes they are sneaky, like making you think that safer is better. 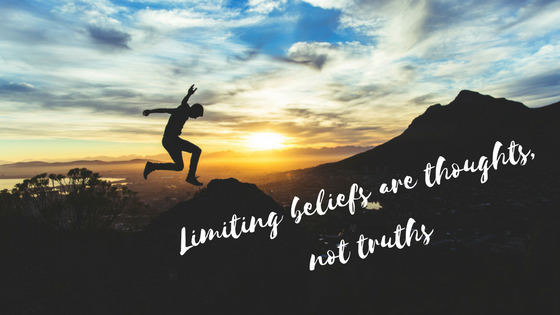 Some limiting beliefs come into our life when we least want them to, especially when we are about to embark on something new and unknown. That Saboteur voice in our head makes us think that staying where we are (in our comfort zone) is safer. But are you truly safer when you become comfortable with your limiting beliefs, fears, or feelings of unfulfilled and unhappiness? Absolutely not! When you hear a voice say, “Don’t follow your dreams, you might fail, choose safe and secure,” that is your Saboteur voice. When you hear a voice say, “You are too old, too young, not good enough, smart enough, strong enough, or enough,” that is your Saboteur voice. Here is the real truth, the truth that your Inner Guide (voice of love) wants you to know: You are enough. You are not too old, or too young. You are smart, wise, and have an inner strength that you have probably already seen yourself tap into when you needed it most. You can do absolutely anything if you want it bad enough. PERIOD. You have already done so many things for the first time because life is full of firsts. That is life. That is learning. That is growing and evolving. You cannot sidestep over a first time.